I have to admit that autumn sometimes leaves me feeling a little beside myself. It’s truer this year because the weather has been beautiful, it’s been great to be outdoors as the landscape transforms, but the very dry conditions have made it a real challenge to capture beautiful images. Past experience tells me that trying too hard usually leads to failure. The picture needs to come to you. So looking for autumn landscapes I must often resign myself to photographing details to capture the color. Even so the dryness has resulted in colors that often seem muted which goes along with the dry crunch of leaves under foot as one explores a favorite path. So the day after day low autumn sun and the resulting bluer than blue skies continue to delight while causing one to wonder where the rivers are finding the water to keep flowing. Every autumn is comes and goes in it’s own way. Leaves along the Big Darby, Battelle Darby Creek Metro Park. Thankfully, as I look for that “autumn landscape”, my wife’s passion for butterflies and other things closer to the lens continues unabated as she contributes by capturing whimsical patterns in leaves . . .
America Basswood seeds, Griggs reservoir Park, (Donna). Wingstem Seeds, Griggs Reservoir Park, (Donna). Milkweed goes to seed, Griggs Reservoir Park, (Donna). Leaves, Griggs Reservoir Park, (Donna). Patterns, Griggs Reservoir Park, (Donna). Virginia Creeper, Griggs Reservoir Park. Grass, Battelle Darby Creek Metro Park. Prairie Grass, Battelle Darby Creek Metro Park.
. . . and the flurry of autumn insect activity. Eastern Comma, Griggs Reservoir Park. Pearl Crescent, Griggs Reservoir Park, (Donna). Buckeye, Griggs Reservoir Park, (Donna). Eastern-tailed Blue, Griggs Reservoir Park, (Donna). Familiar Bluet, Griggs Reservoir Park, (Donna). Yellow Jacket, Griggs Reservoir Park, (Donna). Red-spotted Purple, Battelle Darby Creek Metro Park, (Donna). Virginia Ctenucha, backyard garden, (Donna). We rescued this Wooly Bear Caterpillar (Isabella Tiger Moth) from the bike path and then spent some time observing its behavior. It’s deliberate movement would seem to indicate it was heading for a safe place to spend the winter. 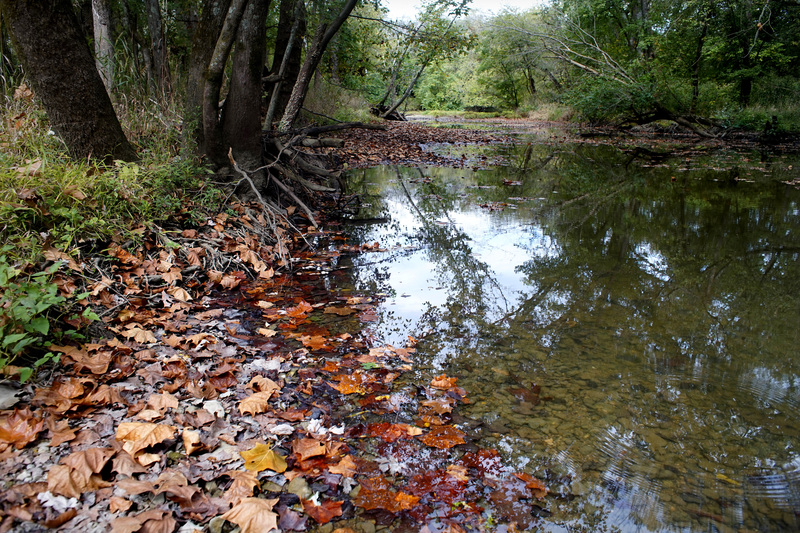 Battelle Darby Creek Metro Park, (Donna). Monarch, Battelle Darby Creek Metro Park, (Donna). Painted Lady, Battelle Darby Creek Metro Park. Over two weeks without appreciable rain, a blue sky, rocky shore, and clear water, Griggs Reservoir. An interesting inhabitant in the Scioto River below Griggs Dam this summer has been a solitary Hooded Merganser. It appears to have become part of an extended mallard family. While undoubtedly not that uncommon, it’s the first time we recall witnessing such behavior. Hooded Merganser, Scioto River below Griggs Dam, (Donna). We continue to see the other usual suspects, some with autumn color to give a sense of place. White Breasted Nuthatch, Griggs Reservoir Park, (Donna). Immature Double-crested Cormorant, Griggs Reservoir, (Donna). 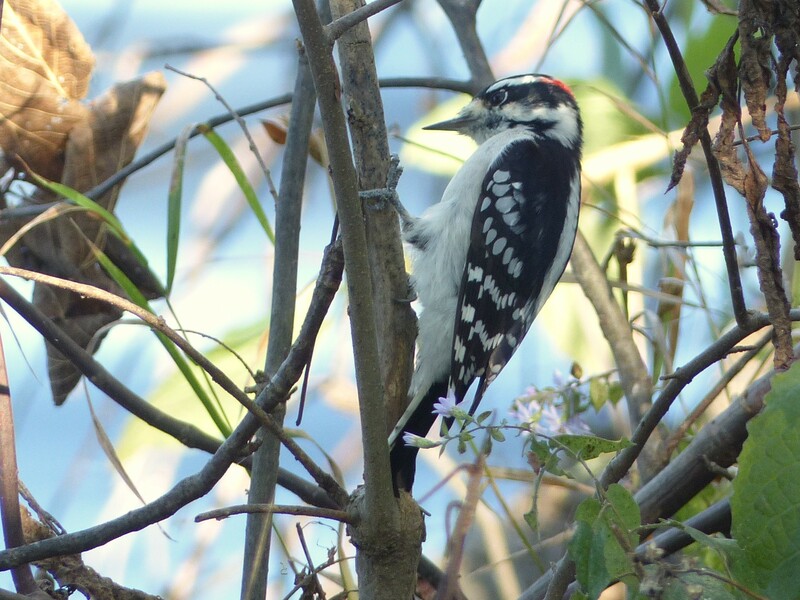 Male Downy Woodpecker, Griggs Reservoir Park, (Donna). 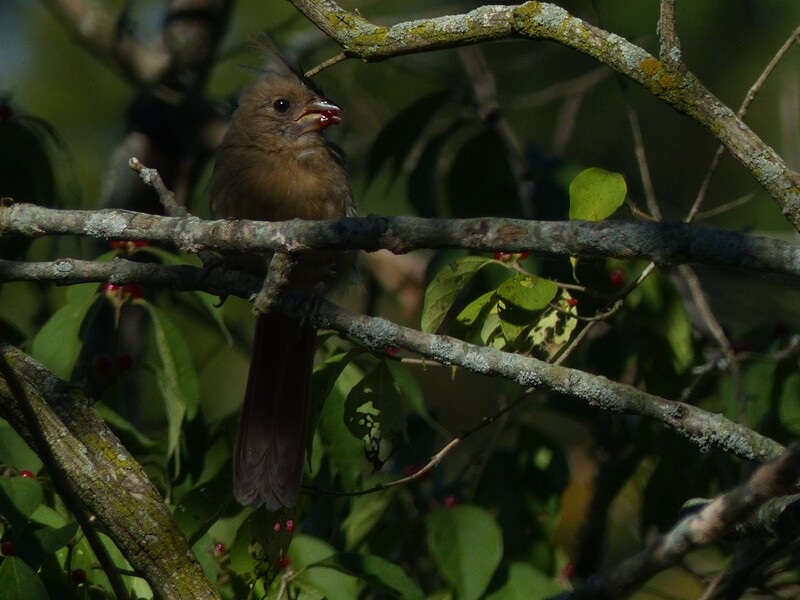 Immature Cardinal, Griggs Reservoir Park, (Donna). Great Blue Heron, Griggs Reservoir, (Donna). 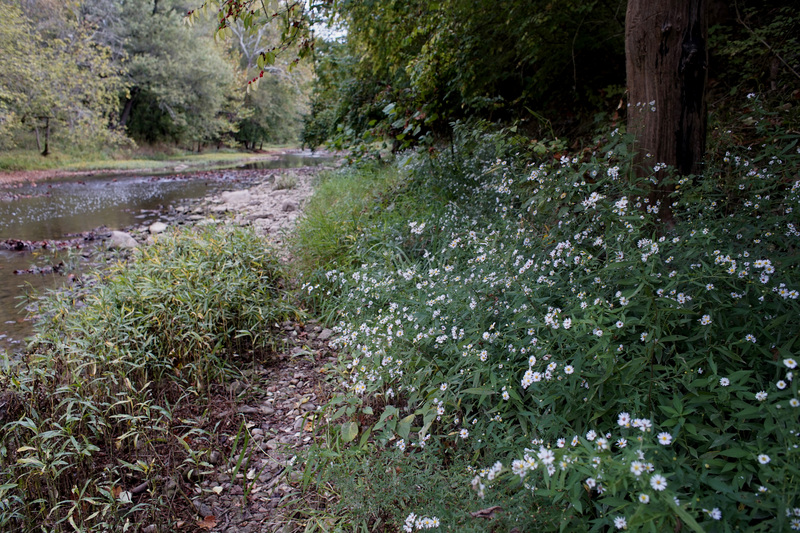 Asters along the Big Darby, Battelle Darby Creek Metro Park. While the autumn leaves may not be living up to expectation, fall wildflowers are doing their best to pick up the slack. Asters, Battelle Darby Creek Metro Park. Lit from behind, Griggs Reservoir Park. Phlox, Battelle Darby Creek Metro Park. Asters look toward the sun, Griggs Reservoir Park. The dryness has made hunting for fungi more hunting than finding but we did come upon one extraordinary specimen that was more than 12 inches across. 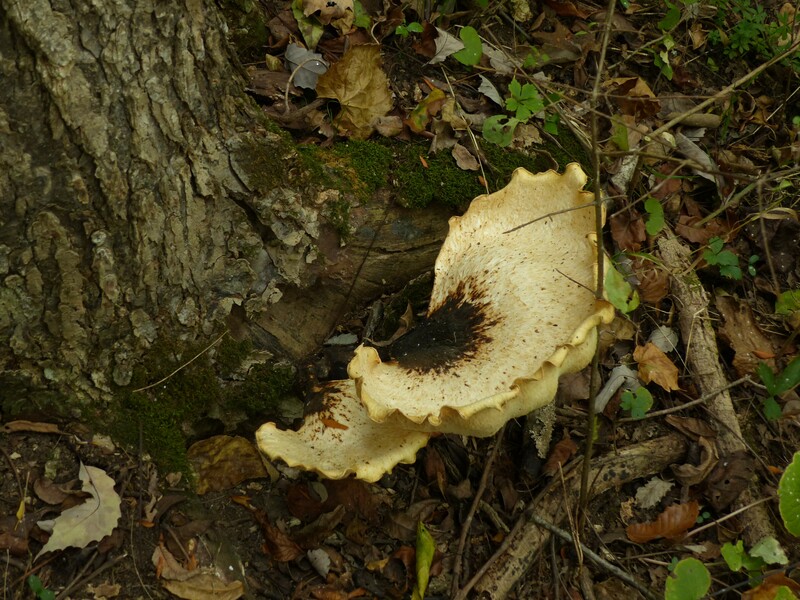 A very large unidentified fungi, Battelle Darby Creek Metro Park. Sunny weather is forecast for the next few days. With cool mornings and warm afternoons it continues to be a great time to be outdoors. If that perfect autumn landscape continues to elude it may be time to pick up the fly rod and head out in pursuit of a Small Mouth Bass. Though decisions! Big Darby Creek at sunrise, Battelle Darby Creek Metro Park. Hopefully the area where you live has been blessed with late summer and early autumn rains that will result in beautiful fall colors and an autumn to remember. Thanks for stopping by. I think New Hampshire and Ohio are in the same boat when it comes to weather. Our fall colors are very drab so far. You have to search long and hard to find anything blog worthy. Nevertheless you found plenty of beauty and interest for this post! I’m not sure I’ve ever seen that big mushroom. It was an amazing mushroom particularly as it was just about the only one seen that was worthy of a picture. You may not have found the swathe of colour that you were hoping for but you certainly found a lot of interesting images on your way. Donna has a great eye for a butterfly. My wife is proof that if the goal is good pictures it doesn’t hurt to have a passion for the subject. As a result of one of your recent posts, I picked up the “Immortal Diamond” by R. Rohr. It’s been a good read! Wow… yes, an amazing and refreshing perspective he has. Now that you mention it, I think I’ll go back and thumb through it again. So glad you picked it up and found it good.